David Adjaye's temple-like canopy, Bjarke Ingels' looped auditorium and Sou Fujimoto / William Matthews' spiralling pathway are among the seven shortlisted proposals for an events pavilion in Edinburgh, Scotland. 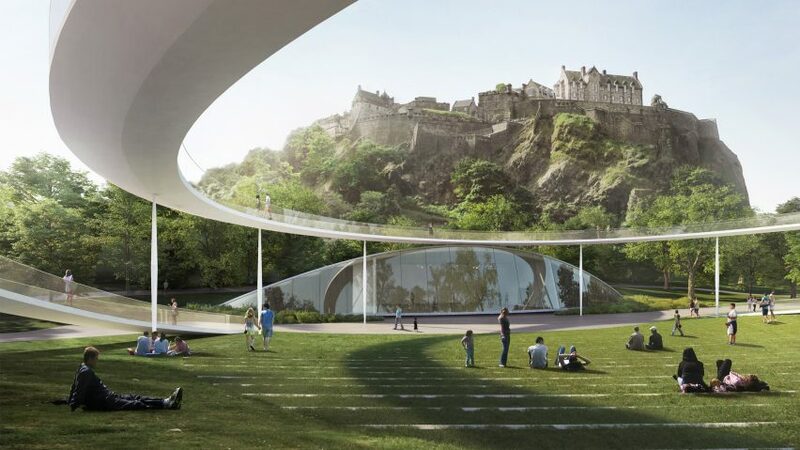 Flanagan Lawrence, Page\Park Architects, Reiulf Ramstad Arkitekter and wHY have also been shortlisted for the Ross Pavilion at West Princes Street Gardens, a public park set below Edinburgh castle. Organised by The Ross Development Trust, the contest asked entrants to design a pavilion to replace the existing Ross bandstand, which hosts key events in Edinburgh's calendar including Hogmanay celebrations and the Edinburgh International Festival's closing fireworks concert. But proposals will also include a visitor centre with a cafe and an update to the surrounding landscape, to make the gardens suitable for cultural events all year round. Adjaye's firm Adjaye Associates has designed a golden structure with large arched openings on all four sides that creates a cover above a performance space, along with a series of stone-clad structures more discreetly embedded in the landscape. Danish firm BIG, lead by Bjarke Ingels, has suggested a ring-shaped structure topped by an undulating roof, which follows the lay of the land below and lifts up above the stage and tiered seating set at either side. The roof would be set on narrow columns to frame views of Edinburgh Castle and the surrounding gardens. Japanese architect Sou Fujimoto teamed up with London-based studio William Matthews Associates, to create a proposal based on the circular forms of Celtic spirals, as well as those found in the stones of Orkney, the original bandstand, the Ross Fountain and the Royal Scots memorial. The result is a ramped pathway that encircles a sloped grassy seating area. A glazed visitor centre would also slots under the spiral at its highest point. Covered in grass, London studio Flanagan Lawrence's design aims to blend into the surroundings but features a sinuous roof that reveals a large semi-circular window to the performance space. The other contenders include a series of gabled structures by Norwegian architects Reiulf Ramstad Arkitekter and a grotto-inspired pavilion designed by Page\Park Architecture in collaboration with West 8 Landscape Architects and BuroHappold Engineering. American design practice wHY has proposed a series of structures with wave-shaped roof gardens. The team also includes GRAS, Groves-Raines Architects, Arup, Studio Yann Kersalé, O Street, Stuco, Creative Concern, Noel Kingsbury, Atelier Ten and Lawrence Barth. The seven proposals were whittled down from 125 entries to The Ross Pavilion competition, which is managed by Malcolm Reading Consultants, and are currently on display in a free exhibition at Edinburgh's City Art Centre, which runs until 30 July 2017, before the winner is announced in early August 2017. Earlier this week, the annual Serpentine Pavilion commission opened in London. Designed by Diébédo Francis Kéré, the first architect from Africa to receive the commission, the pavilion features an indigo-blue structure with a latticed canopy and a courtyard at its centre that will be transformed into a waterfall when it rains.